Before the French Grand Prix, Lewis Hamilton declared that despite the ten-position grid penalty he will face after ramming Kimi Raikkonen in Canada, he "can still win in France". Lewis will face a hard time keeping up with his expectations. In the history of Formula One, only 24 races out 792 (three percent) were won from the 11th spot on the grid or lower. Looking at the most recent races, these wins were influenced by several factors like rain, safety car interventions or race leaders dropping out of contention. In Magny Cours, the best result obtained from a driver who started outside the top ten on the grid is a second by Mika Hakkinen in 1999 (14th in grid) and by Kimi Raikkonen in 2005 (13th in grid). The were both in McLarens. There's one more factor that makes Hamilton's expectations hard to fulfil: in the last five years in the different series Hamilton competed in, he won from pole position 19 times out of 28 and another seven times from the second or third spot of the grid, so these three grid places account for 92 percent of Lewis's recent wins. The only wins he scored after starting lower than third are the second GP2 races at the Nurburgring and Silverstone in 2006. In these races, however, grids were reversed as far as the first eight positions are concerned, so Hamilton had in front of him cars he defeated on the same track one day before. Before the French Grand Prix, Ferrari cars across the whole history of the Championship have run for 449.670 kilometers. With 330 more (that is roughly 75 laps of Magny-Cours) it will be the first team in history to record 450,000 kilometers of racing. After the Canadian Grand Prix, Alonso's podium drought reached seven races. Since Fernando climbed on the podium for the first time in his career back at the 2003 Malaysian Grand Prix, only once has he been outside the first three places for more than seven races. It happened between Malaysia and the US Grand Prix in 2004, for a total of eight races. Alonso was back on the podium at following French Grand Prix, where he finished second. Despite his retirement in Canada, Kimi Raikkonen recorded his fourth-straight fastest lap and now only two longer sequences stand in front of him: Alberto Ascari had a sequence of seven fastest laps, between Belgium 1952 and Argentina 1953; and Michael Schumacher had a sequence of five, between Bahrain 2004 and the 2004 European GP. Also, after Canada the sequence of fastest laps set by cars carrying odd numbers continues, and equals the one set in 2004 - seven races. Michael Schumacher approached the French weekend after his controversial win in Canada, knowing that with Hakkinen on track the situation would have been very different: the McLarens had soundly beaten Michael in the three races before Canada. Hakkinen took pole, Schumacher was alongside him and behind them David Coulthard and Eddie Irvine. The race was decided at the start - Hakkinen was pipped by Schumacher and Irvine, who passed both McLarens. That was the ideal scenario in a track where overtaking is very difficult. Schumacher pulled away to an easy win, while Irvine behind him kept the McLarens at bay. Ferrari recorded their first double since the 1990 Spanish Grand Prix. Rain was the crucial factor both in qualifying and in the race. On Saturday the grid was a total surprise, with Barrichello on pole in his Stewart and championship leader Hakkinen down in 14th. The start of the race was dry, and after some laps led by Barrichello, the McLarens showed their potential - Coulthard blasted past Rubens and pulled away until electrical problems forced him to retire, while Hakkinen passed everyone in his path and set after Barrichello. Then the skies opened and the rain was so intense that the safety car was sent in. When the race resumed Hakkinen continued to attack, but fell victim to a spin, losing several positions. Barrichello was still in the lead, but soon Schumacher had his say as the 'rain master': he took the lead and started to pull away, until an electrical problem forced him in the pits and subsequently left him in the middle of the pack. There was another few laps in the lead for Barrichello until Hakkinen accelerated past him and hit the front, pulling away at a phenomenal pace. The Finn, however, still had to make a stop, and when he entered the pits, Heinz-Harald Frentzen took the lead and won the race. The German's success lay in a mad decision from his pit crew - they fuelled him to the finish at the 22nd lap (of 72!) so he didn't have to stop in the final stages when everybody else had to refuel. At the start of the race the two Ferraris were able to run one-two, with Schumacher in front and Barrichello behind him, keeping Coulthard and Hakkinen in check. At the first round of pit stops the superior speed of the McLarens had the best of Barrichello and the two Woking cars set after Schumacher; they were on his tail by mid-race and then Coulthard started to attack him, but the German closed the door every time. Coulthard was very upset by Schumacher's behaviour and started to make gestures at the German, but he was eventually able to pass and pulled away. Schumacher kept second place at the second round of pit stops, but his engine failed a few laps before the end and Hakkinen completed the McLaren double. The 30th of June was the day of qualifying, and it was also Ralf Schumacher's birthday. The German decided to receive very soft tyres as a present, and he used them to take his first-ever pole. In the race, however, he was not able to pull away and kept everyone behind him until he made his first stop. At that moment his brother Michael went in the lead, while Ralf rejoined behind him and kept on blocking all the rivals. The only one who had the pace to challenge Michael was Juan Pablo Montoya, however when he came up to the back of Ralf and the team ordered the latter to move over to let Juan Pablo through, Ralf refused and Montoya was stuck. He was free to go only when Ralf stopped for his second pitstop, but it was too late. Michael's win sealed and Montoya suffered an engine failure, giving second place to ... Ralf. In the first part of the race a group composed of Montoya, Michael Schumacher and Raikkonen pulled away from the rest of the field, setting their sights on the win. After the first round of pit stops Schumacher took the lead and quickly left Montoya behind, the Colombian being closely followed by Raikkonen, Coulthard and Ralf Schumacher. But after a few laps Michael was penalised for crossing the white line that marked the end of the pit-lane when he was returning on track after his stop, and the German fell behind Montoya and Raikkonen. Juan Pablo fell away after his second stop, and in the final stint it seemed that Raikkonen would take his first win. But a few laps before the end he slid on McNish's oil at the hairpin and Schumacher passed him to take the victory and the title, with six races still to go in the season. A Williams/BMW double in qualifying, in the race and in the fastest laps ranking. The blue and white cars also occupied the first two positions for the entire race. That was it. Before the race everyone opted for a three-stopper, but what if you were stuck behind a slower car? Well, you refuel short at the second stop, you make an amazing third stint and after your fourth stop you have the win in your hands. And that is precisely what Michael Schumacher did to beat Alonso, who was unable to defend himself against this strategy. The front row of the grid had Alonso on pole, with Jarno Trulli alongside him. After the start Alonso kept the lead and pulled away, while Trulli blocked everyone, so that at his first stop Fernando already had half of a minute over everybody else. It was a cakewalk, further helped by his main rival, Rakkonen, recieving a ten-place grid penalty for an engine change and starting 13th. He finished second. 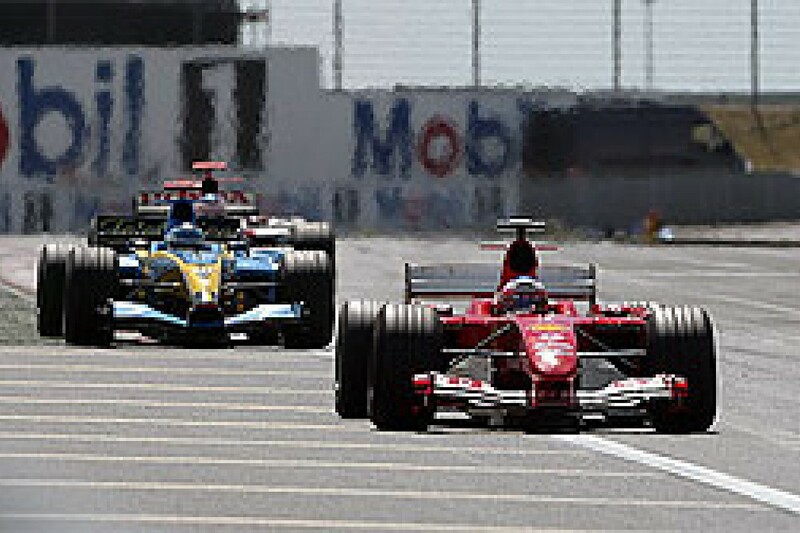 The Ferraris were able to take the front row and at the start Schumacher pulled away to a solitary win, while Felipe Massa behind him was busy in keeping Alonso at bay. 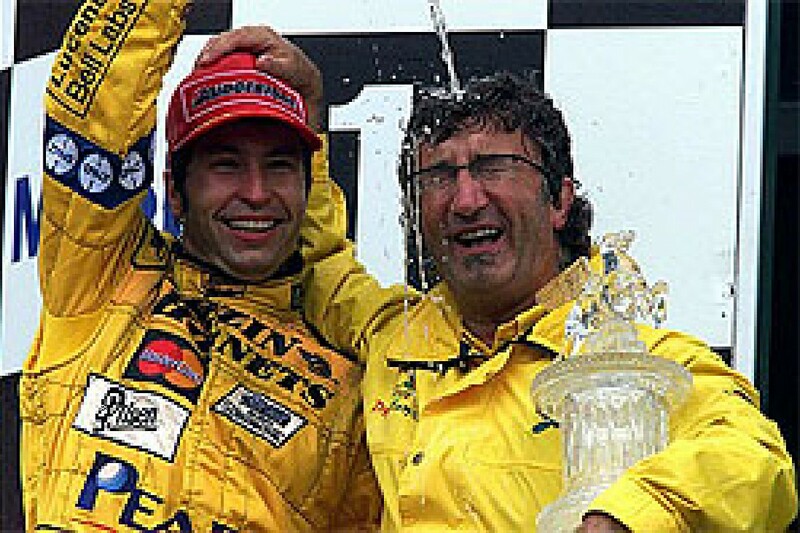 The Brazilian was able to fend off the Spaniard for the whole first stint, but at the pits the Renault team took revenge for the 2004 defeat: they changed strategy, switching from three to two pit stops. Massa backed off after his second stint, claiming traffic problems, and Fernando pipped him for second place. After qualifying, one of the four rivals for the title, Alonso, was practically out of contention for the win as he had to start tenth after a gearbox failure. Right from the start the Ferraris were able to set their own pace, leaving behind Hamilton, who had the same pace of the red cars ... only if he made one more pit stop. Massa and Raikkonen ran in formation up to the second stop, when Massa had a disastrous in-lap and Raikkonen was able to come out of his stop in the lead and take the win. • Kimi Raikkonen has been in the points since 2002, racking up a win and two second places since then. He has never retired from the French Grand Prix, but he has also never started from the front row. His best qualifying result was third last year. • Felipe Massa has only scored points and podium places in his two last appearances in Magny Cours. He retired with mechanical failures in 2002 and 2005. • Nick Heidfeld's best result was a fifth place scored last year. The German has finished in the points only three times out of eight starts. Heidfeld has finished every the French Grands Prix that he has contested. His best best qualifying result was a seventh last year. He has only qualified inside the top ten one other time, in 2001 (ninth). • Robert Kubica in only one attempt did better than his team-mate has managed out of eight. He was fourth last year. • Fernando Alonso was second in 2004 and 2006 and won in 2005. Last year he finished seventh after starting tenth. • David Coulthard won at Magny-Cours in 2000 and racked up two more podium places in 1995 and 2002. The last time he finished in the points was in 2004 with a sixth place. He set the fastest lap five straight times from 1998 to 2002. • Mark Webber has finished in the points only once out of six starts with a sixth place in 2003. He only qualified inside the top ten in 2003, when he was ninth. • A curious pattern for Jarno Trulli in France - he was in the points in 2000 and 2001, then the two following years he retired, then he was back in the points in 2004 and 2005 and then two more retirements in the last two races. Jarno has always qualified into the top ten since 1999. • The best result in France for Rubens Barrichello is a third place, which he scored three straight times from 1999 to 2001 and then again in 2004. That was the last time he scored points in Magny-Cours. The 2002 French Grand Prix was the last one in which Rubens Barrichello wasn't able to start. The Brazilian is on a streak of 101 consecutive race starts, putting him 15th on the all-time rankings. The leader is Riccardo Patrese, who managed 187 consecutive starts between Belgium 1982 to the end of his career. • The best result for Giancarlo Fisichella is a sixth place scored in each of the last three races. • In the last 10 races, only three times has the polesitter won the race: 2003 (R.Schumacher), 2005 (Alonso) and 2006 (M.Schumacher). • the last time a McLaren won the French GP was in 2000 (Coulthard). Before this win, to find another McLaren success we must go back to 1989 (Prost). McLaren has won five times in France. • The most successful manufacturer in the French GP is Ferrari, with 16 wins, the first in 1952, the last in 2007. Ferrari has won five times in the last seven years. Since 1997, Ferrari has missed the podium only in 1999. • McLaren recorded its last pole in Magny Cours in 1998 (Hakkinen). Since then the Woking-based cars have been on the front row only twice - in 2000 with Coulthard, and in 2007 with Hamilton. • BMW Sauber's best result is a fourth last year recorded by Robert Kubica. • Neither Red Bull nor Toro Rosso scored points in Magny-Cours. Last year both Toro Rosso cars retired. • Since its dominant double in 2003, Williams scored only one point in Magny-Cours (Montoya, eighth in 2004). • Honda has never made it into the top ten on the grid. 22nd of June, 1975, Zandvoort. The Dutch Grand Prix started in the rain, and Niki Lauda was able to take the lead from pole. After a handful of laps however the rain stopped and the track began to dry, and the decision to switch to dry tyres was crucial. James Hunt took a gamble and stopped as early as the seventh lap, dropping to 19th place, but soon afterwards everyone was in the pits and he emerged as the clear leader. Lauda fell behind Jarier after the stop and wasn't able to pass him for 30 laps, and this gave Hunt the advantage he needed to win his first race and the first, and only, for the Hesketh team. 1954 - First pole, win and fastest lap for Mercedes. The winner and polesitter was Juan Manuel Fangio, while the fastest lap was recorded by Hans Herrmann. 1964 - Ten years later it was the turn of another team to take its first win - a Brabham won for the first time in the hands of Dan Gurney. 1979 - First win for the Renault team. Jean Pierre Jabouille took the 'yellow teapot' (the nickname of the Renalt turbo) to the highest step of the podium for the first time. 1990 - 100th win for Ferrari, claimed by Alain Prost.